Here’s what’s up in the world of TV for Tuesday, August 22. All times are Eastern. 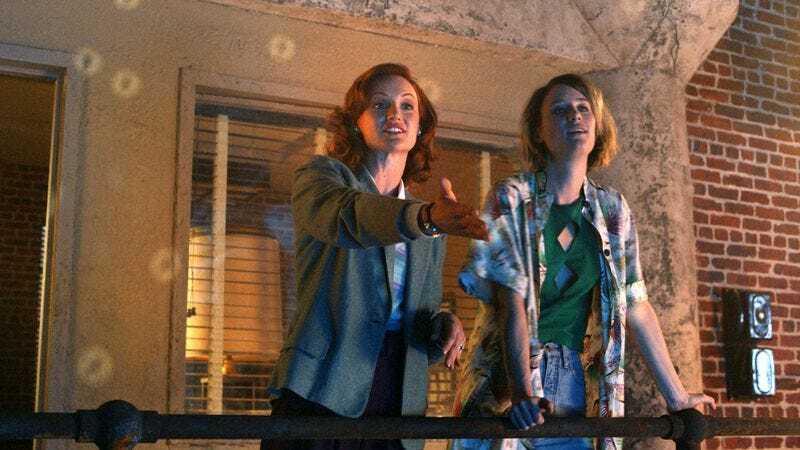 Halt And Catch Fire (AMC, 9 p.m./10 p.m.): This show about the personal computing boom in the 1980s took a little time to find itself, but it really came on strong in the back half of its second season, and tonight’s two-part premiere sees the show make the big jump to California and Silicon Valley. Of course, it’s worth noting Halt And Catch Fire isn’t just the answer to the question “What’s On Tonight” but also “What Was Unexpectedly On Sunday Night When AMC Decided To Run The Premiere In Place Of A Second Freaking Hour Of Talking Dead.” But the former is less of a mouthful, and tonight has both the now previously aired premiere and a second episode for all to enjoy. Donnie Brasco: The Real Story (Reelz, 9 p.m.): This hour-long documentary special explores one of the most remarkable stories in law enforcement history, as FBI agent Joseph Pistone spent six years infiltrating the New York mafia as one of the bureau’s very first deep-cover agents. The subtitle and the show description take some mild shots at the 1997 movie, so we guess get ready for some records to be set straight. The View: 20 Years In The Making (ABC, 10 p.m.): Barbara Walters returns to The View for this primetime special on the show’s first two decades. We can only assume—and hope, because it’s her damn hallmark, and more power to her—that Walters is breaking out the very softest of focuses for her series of interviews with celebrity fans and show co-hosts past and present. Casual (Hulu, 3:01 a.m.): We’ll admit we don’t really keep current on this show—we have no big objection, but all these ennui-soaked comedy-dramas kind of run together at a certain point—but the second season is wrapping up, and we’re going to take a wild guess and assume things don’t end with everyone settling down into serious relationships. Just seems off-brand, you know? Or maybe they do! Maybe Casual can’t be contained by our narrow expectations. One Shot (BET, 10 p.m.): There’s a surprising number of premieres tonight, so much so we’re just focusing on the series openers. First up is this latest spin on the musical competition show, as rapper Sway Calloway hosts a national search for talented new hip-hop artists. The series is starting in Atlanta, and we’re really not sure why they’re even going to need to look anywhere further for hot talent after spending time in the ATL, if we’re being honest. Better Late Than Never (NBC, 10 p.m.): Yeah, this is one where the description pretty much speaks for itself: “The premiere of the reality series that features Henry Winkler, William Shatner, Terry Bradshaw, and George Foreman traveling across Asia with Jeff Dye sans the usual celebrity comforts. First up: Tokyo, where they try to navigate the train station; appear on a popular morning show; and visit the top of Tokyo Tower. They also take a karaoke bus trip to Mount Fuji.” Well, I think we all now know what’s dominating the 2017 Emmy Awards. Milwaukee Blacksmith (History, 10 p.m.): We’re not totally sure why it’s that important to play up the Milwaukee connection—it’s a fine city and all, but is the show’s subject really going to be blacksmithing in a specifically Milwaukee sort of way? Not if the episode descriptions are anything to go by, as tonight’s first two episodes sound way more like this show ought to be called Star Wars Blacksmith. We’re guessing History totally would have gone with that title if they thought Disney would let them get away with it. Anyway, “The Forge Awakens” and “Brew Force” see the blacksmith and his kids working on a custom Death Star fire pit. Playhouse Masters (TLC, 10 p.m.): A Canadian team makes designer playhouses in this new show, and the first episode features a pony-themed playhouse built for Golden State Warriors star Steph Curry and his family. We really feel like the show is burying the lede by calling itself Playhouse Masters. At least for this week, it sure seems a lot more sensible to just go ahead and change the title to Hey! Riley Curry Is In This, And She’s Adorable! You Can Do Better (TruTV, 10:30 p.m.): TruTV furthers its brand as a kind of bro lifestyle network with this latest entry, with tonight’s premiere looking at ways to drink better. Attending office parties, making cocktails, and curing hangovers are all on the docket. WWE SmackDown Live (USA, 8 p.m.): Sunday’s SummerSlam was a bit of an overlong mess, but the good news is that the SmackDown matches tended to be some of the better ones on the card. A.J. Styles vs. John Cena was a legit five-star match between two legends, the six-women tag match was a ton of fun and featured a great return from Nikki Bella, and Dean Ambrose and Dolph Ziggler had a decent enough match for the WWE World Championship. All of which is to say SmackDown has a bit more momentum right now than Raw, but we’re mostly just curious to know if Randy Orton is still bleeding after his encounter with Brock Lesnar, because damn did that look pretty awful. LaToya Ferguson will report back to us. “NXT Takeover: Brooklyn II,” NXT (WWE Network): That said, this was the best wrestling WWE put on this weekend, and it wasn’t even close. We were lucky enough to be in attendance at the Barclays Center for our first ever wrestling show, and this—along with the Cruiserweight Classic—is well worth sampling a free month of the network for anyone even vaguely interested in a little wrestling.